I have a bright red couch. It's really really bright. 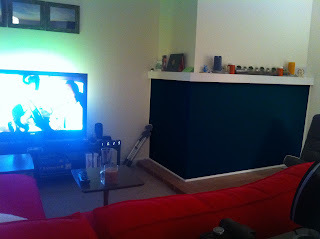 I really like this dark teal color, but didn't want to deal with painting or anything like that. I did have the brilliant idea of using some sort of fabric and stretching it along the wall. Bunny and I headed over to the fabric store and found a great piece of teal denim that would be sturdy enough to make the wall look solid and still have the nice color I wanted in the room. I had my blue wall!